Ariel 1 was designed to contribute to the current knowledge of the ionosphere and of sun-ionosphere relationships. The satellite was a 62 kg cylinder with a 58-cm diameter and a height of 22 cm. A tape recorder and instrumentation for one cosmic-ray, two solar emissions, and three ionospheric experiments were on board the satellite. 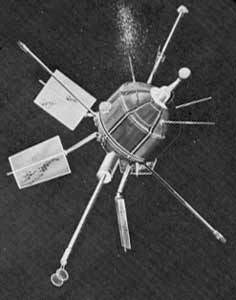 Except for failure at launch of the solar Lyman-alpha experiment, the spacecraft operated nominally until 9 July 1962. Between that date and 8 September 1962, spacecraft operation was limited. The spacecraft was operated again from 25 August 1964, to 9 November 1964, to obtain data concurrent in time with Explorer 20. Ariel 2 was launched from the Wallops Flight Facility using a Scout-X3 rocket. It carried 3 British experiments to measure galactic radio noise.